Osteria Casuarina is one of the leading wedding venues on the Tweed Coast, situated between Gold Coast and Byron Bay. Whether you are after an indoor ceremony location or an outdoor ceremony location, Osteria has you covered, with a contemporary indoor reception space and private courtyard garden, complete with festoon lighting and fairy lit bougainvillea arbours. Your indoor wedding reception can come to life with fairy lit walls, authentic Italian inspired shared feast from the team behind acclaimed Kingscliff restaurants Bombay Cricketers Club and Taverna, and a private outdoor whiskey bar and intimate cocktail garden. With all-inclusive wedding packages including timber feasting tables, European bentwood chairs, wine barrels, market umbrellas, lighting and AV, Osteria provides everything you need to create a romantic and inviting atmosphere for your special celebration. The coordination of your wedding day is in expert hands with professional staff and a dedicated wedding manager allowing you to enjoy a seamless and stress-free planning experience from beginning to end. 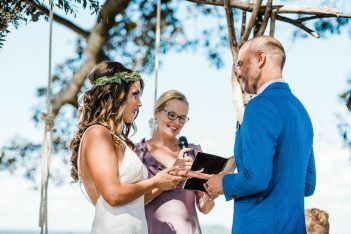 Close to Casuarina accommodation options and surrounded by an array of picturesque wedding photo locations, including Casuarina beaches, Cabarita headland and the lush greenery of Kingscliff, Cudgen and Chinderah, Osteria is the perfect coastal wedding venue.